The winner of the gift card for our 200th linky party is Diana from http://adirondackgirlatheart.com/ Please contact Jann and she will get it in the mail. Congratulations! It is my turn (Jo) to select the features this week, but before we check them out, let’s see what your hosts have been up to. Jann from Have a Daily cup of Mrs. Olson is a very busy bee. She shares her beautiful yard with us. Oh, her roses are to die for. She is teaching her granddaughter to be a wonderful gardener just like her. Carol from Art and Sand is making changes to her darling cottage. Carol is making some beautiful vignettes. Stop by and check out what these beautiful ladies are up to. For me – Jo – from Anne’s Attic – design has not be doing a lot this last week. I deal with several health issues and on top of that I took a bad fall last Friday. I am taking the rest of the month off, but I will be here for Share Your Cup on Thursdays. I need time to take care of myself. I am even missing a wonderful trip to Lake Powell with my family. 😦 But there will be lots of peace and quiet here at home. The Marmelade Gypsy shares her lovely tea time. I would love to sit at the beautiful table. At My Heart Lives Here blog she shares her beautiful mantle with wonderful chippy white windows. I am so happy to see Kris from Junk Chic Cottage back blogging about her new cottage. She shares it room by room as she prepares it in her special way. 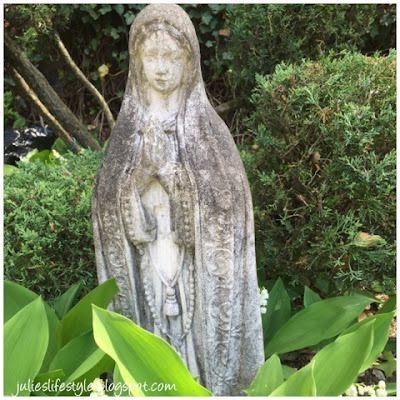 Julie’s Life Style blog shares the beautiful work she has done in her lovely yard. 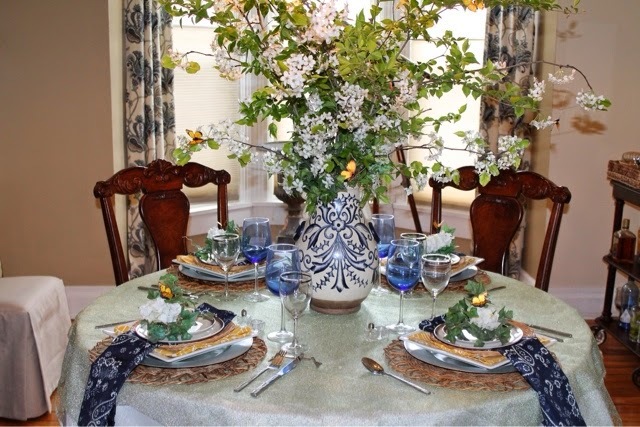 At Row house blog she shares a very lovely Spring table setting. Oh, do I love smoothies. Here is a wonderful recipe for a Lemon Mango smoothy at Spreading Good Taste blog. I want to give a very special thank you for all of your lovely posts that you share each week. Grab the button above if you have been featured today! This entry was posted in Anne's Attic - design, Arts and Sand, French Nordic Country Design, Have a Cup with Mrs. Olson, Rachel Ashwell - Shabby Chic Design, Shabby Chic Design, Share Your Cup Linky Party, Uncategorized and tagged Anne's Attic - design, Anne's Attic - Design .com, Antiques, Art and Sand Blog, DIY, Farmhouse Design, French Nordic Design, Have a Cup of Mrs. Olsen, Prairie Design, Romantic Farmhouse, Shabby Chic, Share Your Cup Thursday Linky Party, Vignettes, Vintage Finds by Anne's Attic - design. Bookmark the permalink. Thank you Jo for the feature of my dining space. It was fun to join in. It was a nice surprise and I do appreciate it. Everyone is busy, fluffing the house and working in the gardens. Thanks so much for such beautiful inspirational features and thanks for hosting.